For Global Accessibility Awareness Day, Apple has posted a series of seven videos to YouTube showing how real people make use of Mac, iOS and Apple Watch accessibility features from Switch Control to Siri to VoiceOver. Each tells the story of specific individual in about two minutes. Carlos is the lead singer and drummer of Distartica, and also serves as the social media PR manager of the metal band. His iPhone screen remains off using Screen Curtain, while he uses VoiceOver to call transportation, take photos and post updates online. Andrea, a nursing student, uses Apple Watch to track wheelchair-based workouts and share her Activity with friends as an advocate for the disabled community. Meera is a teenager who loves soccer and expresses herself using TouchChat on iPad. Patrick, radio DJ and music producer, navigates Logic Pro X using VoiceOver and cooks for his family using iOS app TapTapSee to identify ingredients using his iPhone camera. Shane uses Made for iPhone hearing aids and Live Listen in her classroom as choir director teaching music using iPad app Essential Elements with her middle school band students. Ian loves exploring the Pacific Northwest. He can use Siri start a FaceTime call or with the iBird app to play a bird calls, and can capture photos using Switch Control. Todd runs a technology consulting company and was recently featured in using Siri, Switch Control and HomeKit to manage his lights, sound, security system, doors and locks. Apple has a long history of working to make open accessibility a key feature of its hardware products and software development platforms. Apple began bundling VoiceOver, an interactive screen reader for users with visual or motor disabilities, on its iPods, iOS devices and Macs for free starting with OS X 10.4 Tiger in 2004, followed by support included in iOS for the 2009 iPhone 3GS and various iPod models including the iPod nano released the same year. 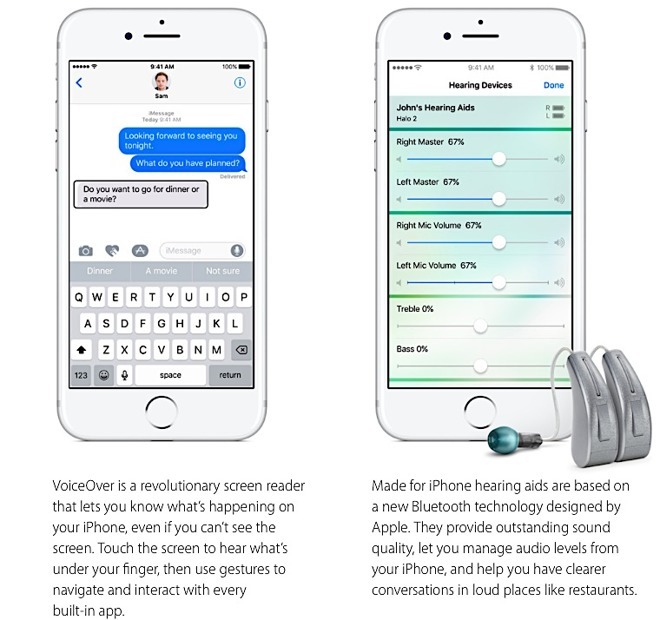 Since then, Apple has developed assistive technologies including 2011's Siri--which debuted on iPhone 4s; Switch Control for iOS and Macs; the and last fall, Live Listen for users with hearing impairments. Siri expanded to support Eyes Free use in cars starting in 2012, followed by CarPlay in 2014. Siri has also become a key feature in the company's emerging business of wearables, both with Apple Watch and the new AirPods, where Siri serves as the primary user interface. "Apple has done more for accessibility than any other company to date"
Mark A. Riccobono, president of the National Federation of the Blind, stated that "Apple has done more for accessibility than any other company to date." The comment echoed praise from blind-from-birth performer Stevie Wonder, who in 2011 told his audience, "I want you all to give a hand to someone that you know whose health is very bad at this time. His company took the challenge in making his technology accessible to everyone. In the spirit of caring and moving the world forward, Steve Jobs." Last year at its Worldwide Developer Convention, Apple hosted accessibility advocate Haben Girma, who spoke to attendees about the value of designing products with disabled users in mind.